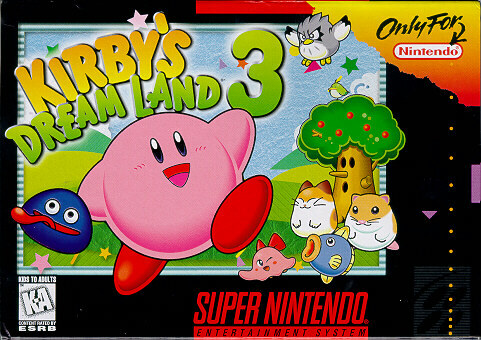 Kirby's Dream Land 3 is the somewhat lesser-known of the two SNES Kirby platformers, typically overshadowed by the highly popular Kirby Super Star. Released in late 1997, it was the last first-party game to be released on the SNES. This was after the release of the Nintendo 64, so it went largely unnoticed. The most apparent feature of Kirby's Dream Land 3 is the unique graphical style: by using color blending between adjacent pixels of dithered sprites, a unique hand-drawn appearance is lent to the game. Combine this with the solid platforming, two-player cooperative play, and catchy music that Kirby games are known for, and you have one of the best games on the SNES. I'll be taking advantage of the excellent two-player simultaneous capabilities. I will be player one, controlling Kirby. Kaz, who you may remember from one of my Kirby 64 videos, will be player two, controlling Gooey. Although he hasn't played quite as much Kirby as I have, I am sure he will prove to be a valuable ally and brave companion in our adventures on Pop Star. Kung-Fu Jesus also joins in as a guest commentator starting with the second video.